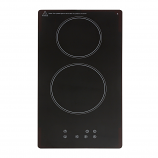 Indesit 4 zone ceramic hob with side controls. 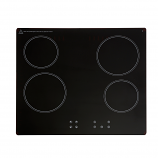 Montpellier CER31NT 30cm ceramic domino hob is the perfect edition to your kitchen if you lack cooking space and want a sleek and stylish design. It also allows you the flexibility to mix and match your cooking styles to create a modern combination design. 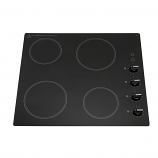 Montpellier CER61NT 60cm ceramic hob is the perfect edition to your kitchen if your looking for a 4 zone hob with a sleek and stylish design that gives the impression of fluidity between the hob and your worktop. The ceramic surface also makes wiping up spillages much easier.